This necklace has a focal of a copper smelter firebrick Cut from a fire brick that once lined a copper smelter in Michigan many years ago! Basically the copper permeates the fire brick leaving what you see in this cab. The cab is solid copper other than the little white spots. All that's left of the fire brick are the small spots, the rest has been replaced with solid metallic copper. Very unique and one of a kind this pendant has a minimalist design to not take away from the beauty of the piece. 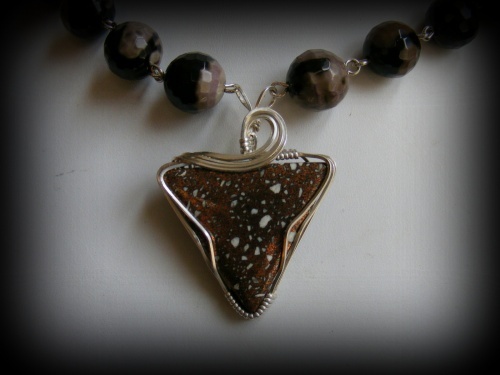 The necklace part has jasper beads that just go perfect with this focal. Has a beautiful sterling silver hook clasp. Measures 19" long.